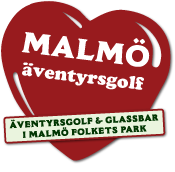 In close cooperation, and as a franchisee of Ben & Jerry’s Sweden, we run an ice-cream parlor also serving as a cashier for the minigolf. This gives you the opportunity to enjoy Ben & Jerry’s delicious ice cream, staright from our scoop bar. With flavors such as Berry N’ice, Baked Alaska, Cherry Garcia, Strawberry Cheesecake etc Ben & Jerry’s has created a strong position in the swedish market. The ice cream as well as our tasty coffee is of course Fair Trade. From our patio seating you can also enjoy great views of the golf course. Take a look at our commercial video! Last game out on the minigolf course is 45 minutes prior to closing time. * Subject to change due to bad weather.